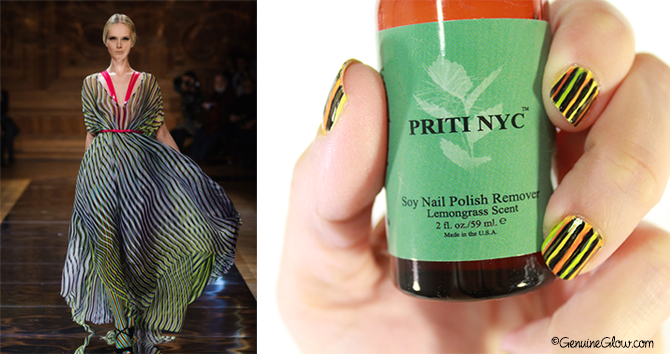 Runaway-inspired nail art has become quite popular lately, and I was very excited to learn that Priti NYC collaborated with Oscar Carvallo for his 2014 Spring/Summer Couture show in Paris. The show featured a colorful, striped pattern that Priti adapted into a fun nail design. Despite my beginner level of nail painting skills, I re-created the look using the same Priti NYC vibrant nail polish shades featured in the show. The shades that were used are, (in the same ordered pictured in the second image above): 603-Nigra*, 367-Blue Sage*, 415-Fireglow*, 460-Horned Poppy*, and 504-Stonecrop*. 3. With a clean brush add vertical colored stripes in between the black ones. I used Stonecrop and Fireglow. 4. Add a Top Coat to seal the colors. Done! With this being the first time that I am featuring Priti NYC, let me add a few thoughts about it. 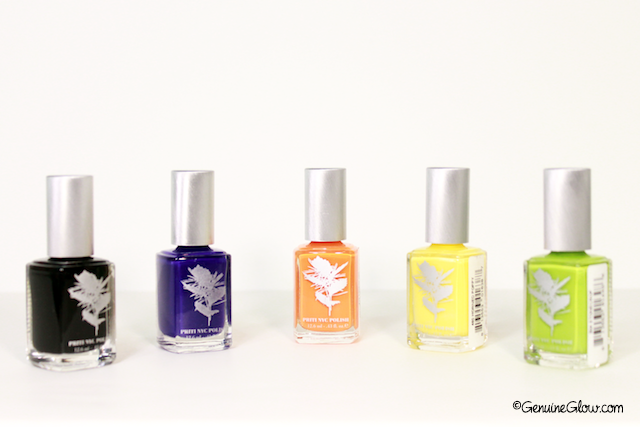 Priti NYC Nail Polishes are 5-free, so they do not contain toluene, dibutyl phthalate, formaldehyde, formaldehyde resin, and camphor. The applicator brush is slightly larger than average which makes the application easier (and a nail dummy like me surely appreciates that). The wearing time has left me quite pleased, since I don’t usually get more than 2-3 days without chipping. I wore the shade Horned Poppy for 5 days without top coat and minimal wearing on the tips before it chipped. On top of the nail look pictured above, I applied some top coat (I have ordered Priti’s Speedy Dry Top Coat but have not received it yet) and I wore it for over a week with no chipping at all. Priti NYC lacquers do not smell as strong as most nail polishes, which is something I obviously appreciate much having such a sensitive nose toward toxic-smelling fumes and odors. 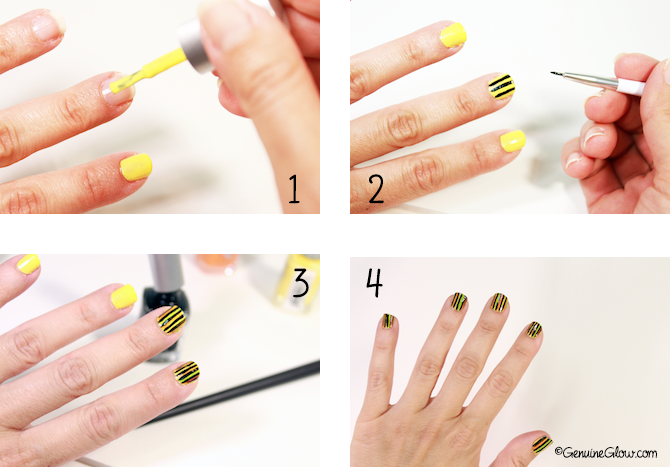 In order to get the full-coverage, bright yellow above, I applied two coats. 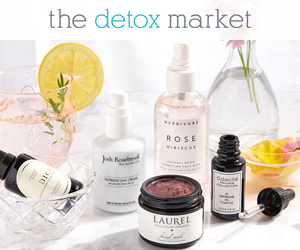 While the nail polishes are good and definitely compare to some of my other favorites nail polish brands, Priti NYC Soy Polish Remover is totally newsworthy. The formula is soy based, has a oily texture and smells lovely, (I bought the lemongrass scented version, but they make it unscented as well). It is very concentrated, so a small amount goes a long way. Because of the oily formula, it leaves my cuticles feeling soft, and my nails looking shiny. Best of all, it takes the nail polish off easily and works just as well with any other nail polish. It is unfortunately more expensive than the average acetone-based nail polish removers, but it is well worth the money, in my humble opinion. I purchased mine from Spirit Beauty Lounge, and will definitely repurchase it. Priti NYC Nail Polishes ($15 each) are available at Priti NYC, but you can also find Priti NYC at Spirit Beauty Lounge, which currently has some lacquer shades one sale. Grab them! Next on my Priti wish-list are the Glass Nail File (does any of you own one of these? I am so curious about it!) and the nail polish #439 Chorus Line, which is part of the Palm Beach Spring 2014 Collection. Have you tried Priti NYC yet?